Bernie Granados, Jr. is a multi-talented artist who works in a wide variety of mediums, including embossed acrylic paintings, watercolor, Prismacolor pencil, pen and ink drawings, wood carvings, ceramic, and bronze. 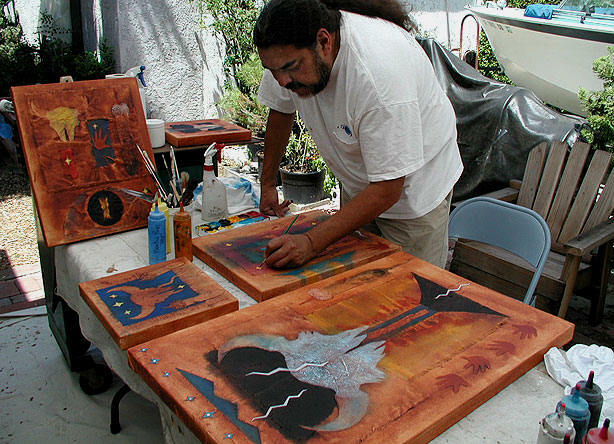 Drawing from his Apache and Zacatec roots, Mr. Granados produces paintings, sculptures, masks, prints, and miniatures featuring beautiful images of horses, buffalo, and ancient ancestral figures inspired by by visions and cave art throughout America. He finds inspiration in Nature’s force and beauty, his smarter-than-human quarter horses, his fellow artists, and his love and respect for the Creator. 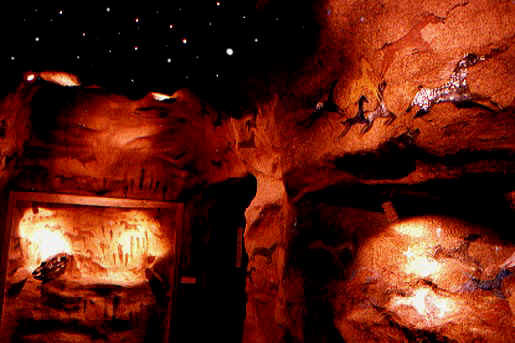 "Spirit Horse Cave" 40' cave installation, designed by the artist and completed with the help of the intrepid staff and volunteers of the Southwest Museum. 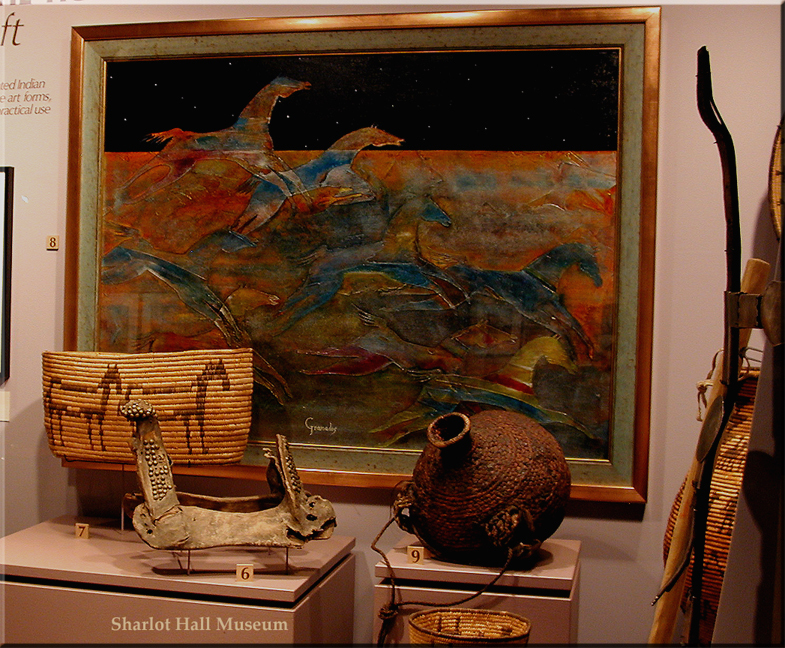 The exhibition, "Spirit Horses", curated by Dr. Kathy Whittaker, was up for over 2 years. 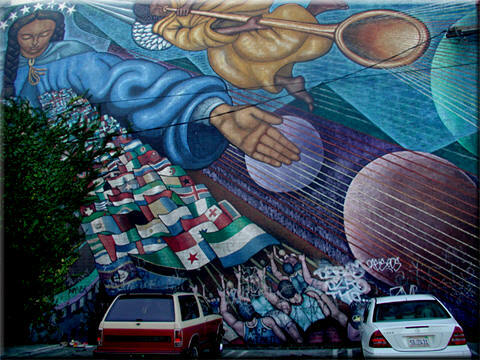 The "Spirit Horses" Mural. in the Sprague Auditorium. 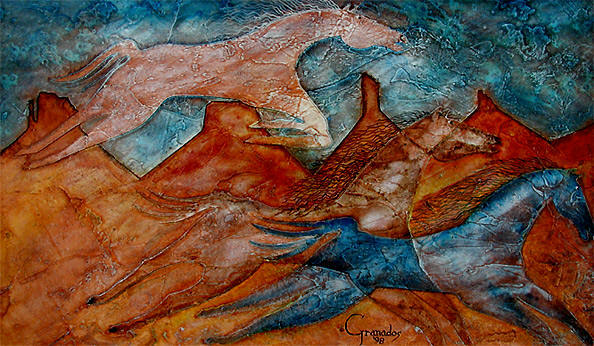 The horse-images are 24" and 36" long. As a youth he derived inspiration from the old and contemporary masters, spending much time in art galleries and museums and enjoying time in the presence of these celebrated pieces of art history. 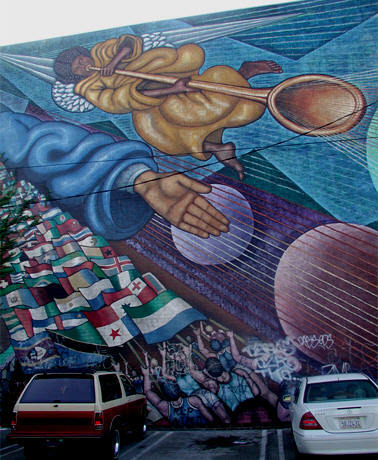 Mr. Granados is a gifted teacher who headed the Fine Arts Department of the Intertribal Pre-University Summer Program at University of California, Irvine and taught at the High School of the Arts in Los Angeles. 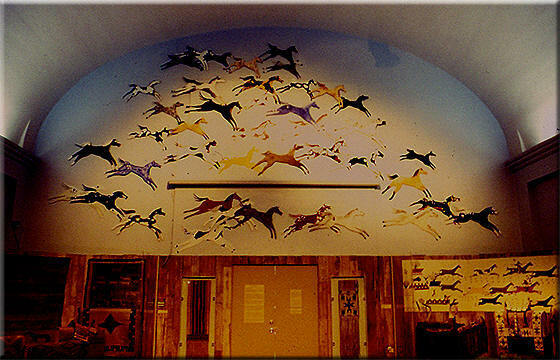 He is listed in the Biographical Directory of Native American Painters. 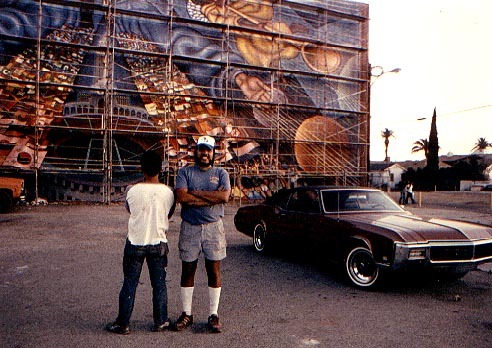 Bernie was one of the featured artists in the LACMA Exhibition "Native Artists for the 21st. Century." 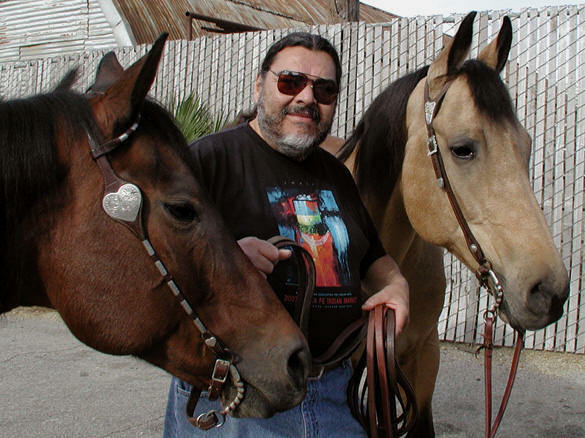 He created the "MADCOWpony" for Horsepower New Mexico’s "Trail of Painted Ponies." He has worked in the film industry for 21 years and maintains a "fine-arts-for-motion-pictures" website, clearedart.com, that features fine arts commissions and rentals, for the industry. 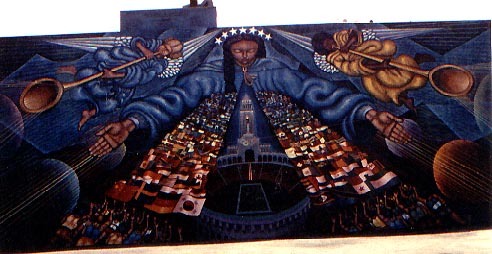 Granados’ works are collected by such notables as Ben Kingsley, Dustin Hoffman, and Ted Turner. 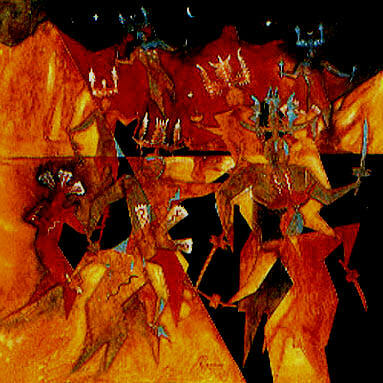 His artworks have been used in such shows as "The Native Americans", "Highway to Heaven", "Gabriel’s Fire", "Who’s Harry Crumb? ", "Evolution", "CSI", and many more. Today Mr. Granados’ ongoing passion is helping Native youth cultivate their artistic talent and knowledge. 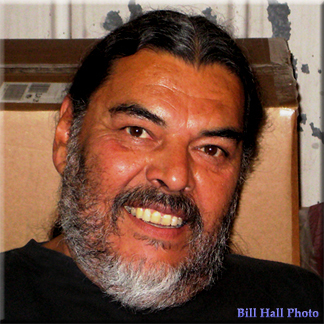 He was an Artist in Residence at the Southwest Museum and assisted the Museum in developing the "Native Mentors" program which has provided an educational opportunity for Native youths to learn more about the arts from the Native professionals in the community. This curriculum is now available for tribes to develop native youth’s artistic techniques at the professional level, http://nativementors.com. Mr. Granados currently is a Board Member, and on the faculty, of the San Joaquin River Intertribal Heritage Educational Corporation, where he also shares, through teaching, his knowledge and talent. Bernie currently has artworks at The Autry Museum Store, Los Angeles, California. Bazaar Del Mundo Galleries, in Old Town, San Diego. Notice the destructive vines taking over the surface of the painting, below. 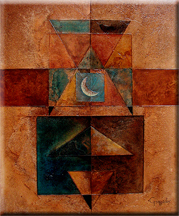 1967 Artist opened first art gallery “Originals by Granados” Encinitas, Calif.
1973 “New Works, mixed-media paintings, assemblages” Pacific Asian Art Museum, Pasadena, Calif.
1976 “Solo Shows” Brookside Wineries, Glendale, and Marina Del Rey, Calif.
“Viajes Infinitos” (Infinite Voyages), Goez Gallery, East Los Angeles, Calif.
1978 “Featured Artist” Feathers Gallery, Scottsdale, Ariz.
1979 “Decade, a Ten-Year Retrospective” The Colonnade, Pasadena, Calif.
1980 “Featured Artist” Many Horses Gallery, Los Angeles, Calif.
1981 “One Man Show” Glory Hole Gallery, Columbia, Calif.
1984 “Native American Images” Jamestown Gallery, Jamestown, Calif.
1985 “Special Exhibition of New Works” Grey Goose Gallery, Jamestown, Calif.
1987 "The Embossed Acrylic Painting Technique" invented by artist. 1987 “Buffalo Spirit Dancers” Turquoise Tortoise Gallery, Sedona, Ariz.
1988 “Contemporary Embossed Paintings” Lanning Gallery, Sedona, Ariz.
1989 “One Man Show” Galleria Santa Fe, Encinitas, Calif.
1990 “Solo Exhibition” Two Bears Gallery, Brentwood,Calif. 1991 “One man Show” Forms Gallery, Delray Beach, Fla.
1992 “Two Man Show, with Michael Horse” Forms Gallery, Delray Beach, Fla.
celebrating the relationship between the native peoples and the horse. The Southwest Museum, Los Angeles, Calif.
1996 “Artist’s 20-year Retrospective” Southwest Museum, Los Angeles, Calif.
1997 “One Man Show” Blaze Gallery, Manzanita, Ore.
“Solo Exhibition” American Shadows Gallery” Lincoln City, Ore.
1998 “Featured Artist Exhibition” Frederika Day Gallery, Weaverville, Calif.
1999 “One Man Show” Blaze Gallery, Cannon Beach, Ore.
2001 “Featured Native Artist” Leona King Gallery, Scottsdale, Ariz.
“Solo Exhibition” Round Dance Indian Art Gallery, Mammoth Lakes, Calif.
“Art from the First People” Friends Gallery, Pasadena, Calif.
2002 “One Man Show” Eldorado Gold Jewelers, Santa Fe, New Mexico. 2003 Curated "Native Voices" contemporary Native American art exhibit at the Friend's Gallery, Pasadena, California. 2005 Some of Bernie's art included in the new California/Southwest Hall Exhibit at the Southwest Museum, Los Angeles, Calif. through 2007. 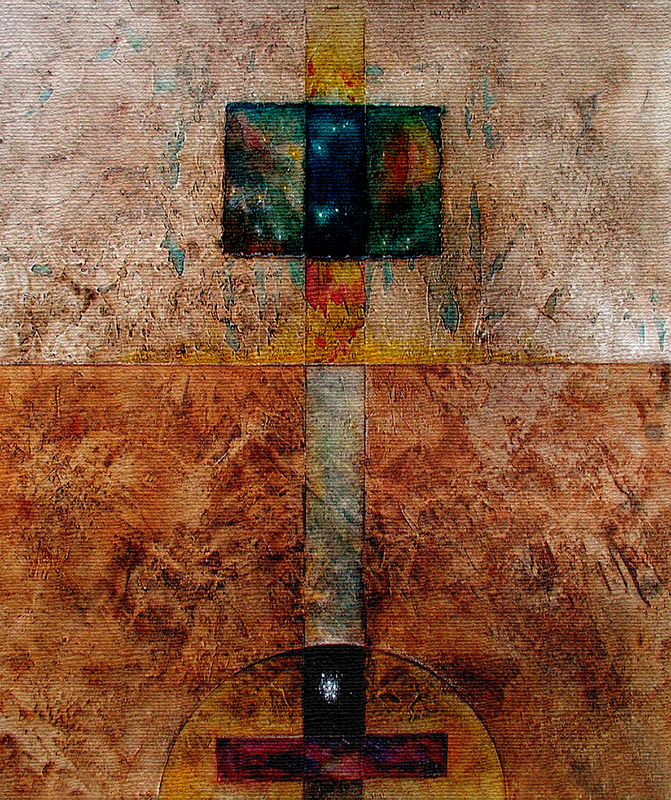 2007 Featured at the Kinnerson Gallery in Reno, Nevada. 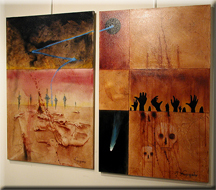 2008 "Spirit Art", solo exhibition, Southwest Museum, Los Angeles, California. “Native American Maskmakers” Two Bears Gallery, Brentwood, Calif.
“Peppertree Ranch Invitationals” Los Olivos, Calif.
“Intertribal Marketplace” Southwest Museum, Los Angeles, Calif.
“Native American Masks” Raven Gallery, Minneapolis, Minn.
Set Design, and solo exhibit for “All’s Well That Ends Well” Luckmann Theater, Cal State Los Angeles, Calif.
Artworks used for Turner Network’s “The Native Americans” movie of the week. The artist, prepping for art exhibit. 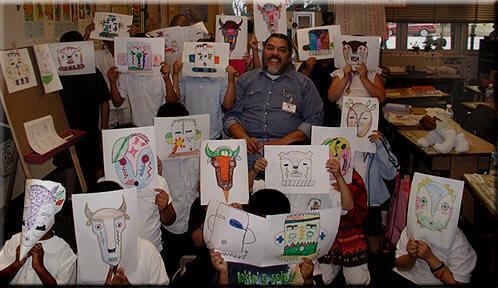 Bernie with Mrs. Seidner's first grade class during a native mask workshop that was held at the Thomas Jefferson Elementary school in Pasadena, California. Bernie with his quarter horses Coho Tippy, and her son, Bandit, a.k.a. "Critical Victory". Bernie and his wife Joey, have been raising and breeding Quarter Horses for over 27 years.